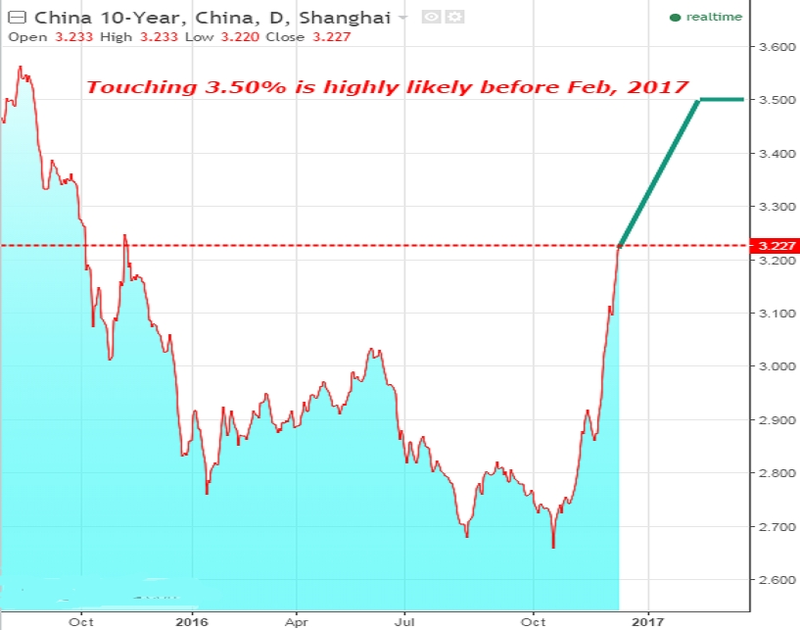 The Chinese 10-year sovereign bond yields hit highest since November last year Thursday after the Federal Reserve increased interest rates for the first time in 2016 and hinted at a faster hike in borrowing costs in 2017, majorly driven by increased inflation expectations and labour market tightening. The yield on the benchmark 10-year bonds, which moves inversely to its price, rose 2 basis points to 3.22 percent, the long-term 30-year bond yield climbed 4 basis points to 3.65 percent and the yield on the short-term 3-year bonds bounced 2 basis points to 2.77 percent. The Federal Open Market Committee increased the fed funds rate to a 0.50-0.75 percent range, as widely expected. The statement noted that information received since the November meeting indicates that the labour market has continued to strengthen and that economic activity has been expanding at a moderate pace since mid-year. Also, the new projections showed that the central bankers expect three quarter-point rate increases in 2017, up from the two seen in the previous forecasts in September, based on median estimates. The State Information Centre researchers in its latest report projected that the China's 2016 GDP to rise to about 6.7 percent; consumer inflation likely to climb about 1.8 percent next year, while the producer prices are expected to increase by 1.0 percent in 2017. Moreover, retail sales in China surged during the month of November, beating what markets had initially anticipated. Retail sales, a gauge of private and government spending, rose 10.8 percent year-on-year, up from October’s 10 percent pace, data released by the National Bureau of Statistics showed Tuesday. Additionally, industrial production in China jumped during the third quarter of this year, adding certainty over the world’s second-largest economy’s steady expansion after having suffered a volatile condition for two long years. China’s Industrial production, a broad measure of factory output, rose at an annualised 6.2 percent, data released by the National Bureau of Statistics showed Tuesday. That exceeded expectations for an increase of 6.1 percent, which would have been unchanged from the October reading. On Friday, consumer prices in China rose during the month of November, remaining slightly above what markets had initially anticipated. However, the figure remained below the upper limit of the government’s target range. China’s consumer price index (CPI) advanced 2.3 percent from a year ago, after climbing 2.1 percent in October, data released by the National Bureau of Statistics showed Friday. A median estimate of economists called for a 2.2 percent year-over-year gain. Compared to October, consumer prices rose 0.1 percent, matching forecasts. That followed a 0.1 percent decline the previous month, the data showed. In addition, the producer price index (PPI) soared 3.3 percent in the 12 months through November, well above forecasts calling for 2.2 percent. Producer inflation has now risen in each of the last three months after nearly five years of decline. Meanwhile, People's Bank of China sets the USD/CNY reference rate at 6.9289, stronger than Tuesday’s 6.9028. The China's blue-chip CSI300 index fell 1.14 percent to 3,340.43 points and the Shanghai Composite Index dipped 0.73 percent to 3,117.68 points.